Lindsay Bowen, Gr 2-3 teacher, Immaculate Conception C. E. S.
A nature walk with Immaculate Conception C. E. S. students. Pathway tracking sheets are posted in the hallways throughout the school. They’re a reminder of the Landmarks for each age group, and an inspiring record of what’s happening in the school, right now! Kindergarten classes go for a nature walk every week, and bring back treasures for their nature collection; they had a visitor talk to them about ants; they went hunting for ants, drew pictures and made ant sculptures with recycled materials. Grade 1-3 classes had an exciting visit from “Nature Nancy” from Think Outside; they visit favourite outdoor places every two weeks, and do activities to celebrate the season every week. 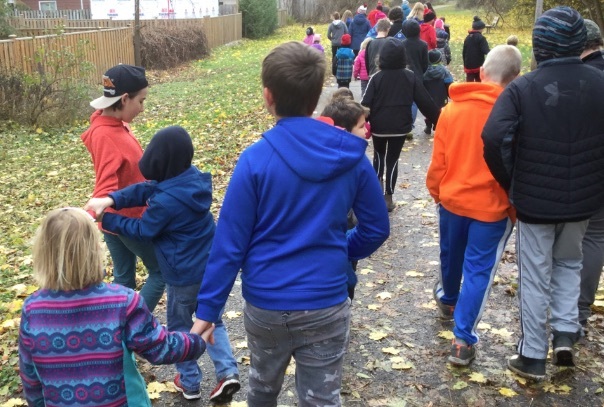 Grade 4-5 classes go for walks every month to a favourite nearby place; they started plants from seed in the classroom, which they’re caring for over the winter, and they’ll take care of the school’s Food Forest this spring; they plan to borrow GPS units from a local high school and start geocaching as well. Grade 6 classes go for walks to the Art Gallery, Del Crary Park, the Museum, and they take nature walks with their kindergarten friends; they tried out a new sport – “sit volleyball” and they’ve built statues from found materials and taken pictures of changes to the natural environment. Grade 8 students have taken on a leadership role in planning and conducting projects to benefit the whole school community; they’ve been working with GreenUP to promote walking and wheeling to school, organizing a school fitness program, and they’re working on plans for an outdoor classroom and possible greenhouse. 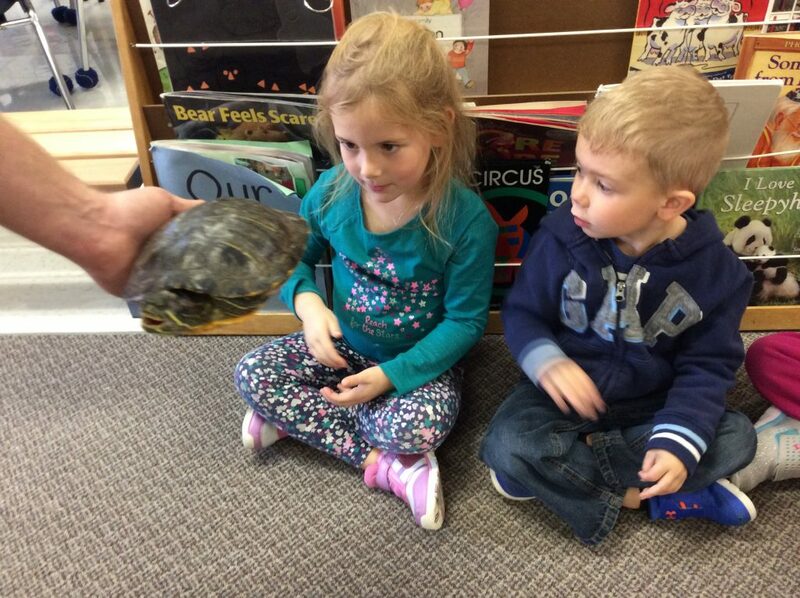 What could be the title of a children’s picture book became a Pathway Landmark brought to life, when a PSK pilot kindergarten class at Millbrook/South Cavan Public School were treated to a special long-term guest in their quiet corner – Starla the red-eared slider – a foster animal provided by the Riverview Park and Zoo. Landmark #5 reads: Look after an animal. Develop empathy by watching and caring for living things. Jenny Todd’s Kindergarten class, part of our Pathway Pilots, did just that. But affording children positive interactions with animals in the classroom requires extra care and consideration. With the generosity of Zoo curator Jim Moloney, The Riverview Park and Zoo helped bring Landmark #5 to life, and into the classroom. 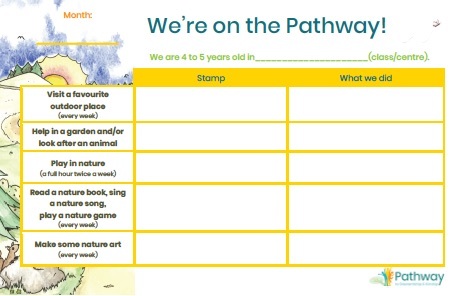 For Pathway pilot kindergarten classes, the zoo has offered short term animal fostering. “We had a wonderful experience with the turtle” said Jenny Todd. Matt Dixon, a zookeeper from Riverview Park and Zoo, brought Starla and her habitat, food and cleaning supplies. While showing Miss Turtle around, Matt provided guidance on safety and hygiene, animal wellness and maintenance to Jenny and her students, to make the experience safe for both the human and non-human animals. The kids were captivated by his set-up, and as he explained all the necessary care and concerns, he was treated to many enthusiastic turtle stories the kids were keen to share! The awe, care and empathy nurtured in children when they foster an animal was obvious as Jenny Todd’s class cared for Starla – a moniker decided after the class held a vote on their new classmate, the former “Miss Turtle”. As the class became more comfortable with Starla and she with them, she could be found basking under the sun lamp as children came to gaze at her in the quiet corner, admiring her and drawing her likeness. Every student also had the opportunity to feed her, and the once-a-week raw fish feed was a favourite! Starla has moved onto yet another kinder class at Millbrook/South Cavan and the children were sad to see her go. But Ms Todd and class are already looking towards possible future fosters. What other pals might join Ms Todd’s class on the Pathway? Thanks to Jim, Matt and the Riverview Park and Zoo for this incredible Partnership on the Pathway!